There are over twelve thousand Hutterians  in North America. A little over eight thousand of them live in Canada, the others in the United States. They all live in cluster-type colonies known as Bruderhofe. Manitoba has over thirty of these colonies, Alberta almost twice as many, and Saskatchewan has six of them. The forty colonies in the United States are largely confined to South Dakota and Montana. Since the Hutterians have subscribed to this ideal for over four centuries, it is necessary to deal at least briefly with their history in order to understand them and their ways. The Hutterian church had its origin in the turbulent Reformation years. Barely had Luther and Zwingli broken away from the Catholic church, when some of their closest supporters pressed for still greater changes. Many of the leaders of these radical reformers were humanists like Conrad Grebel and Dr. B. Hubmaier. In time, these reformers became known as Anabaptists. They were especially numerous in Southern Germany, Austria and Switzerland. The Anabaptists endorsed adult baptism and rejected the use of the sword and the oath. They also stressed the elected lay ministry. To the Catholics the Anabaptists were heretics, and to their fellow Protestants they were seditionists because of their refusal to bear arms. In either case the punishment was death. Many of the Anabaptists escaped the imperial and princely sheriffs by fleeing to the Eastern borderlands. The most accessible of these borderlands in the sixteenth century was Moravia. Thousands of Anabaptists fled there to find sanctuary on the estates of powerful German and Moravian nobles. Several of these Anabaptist groups introduced common ownership of goods. Though the pooling of their worldly resources created many problems of human adjustments, the congregations gained a strong leader in a young Tirolean minister, Jakob Huter. Huter, an uncompromising believer in the community ideal, welded together a small but strong church. Huter died a martyr's death at Innsbruck, in 1536, but he left an indelible impression on and his name to the congregations. Henceforth, they were known as Hutterian Brethren. Mention should also be made of Peter Riedemann, an early Hutterian Elder. Next to Huter no man contributed more to Hutterian thinking than this man, who wrote his Confession of Faith in a Marburg gaol in 1540. To this day this book is found in every Hutterian colony, and no student of Hutterian history can ignore it. The death blow to the Hutterian communities in Slovakia and Transylvania was dealt to them during the reign of Maria Theresa, in the eighteenth century. The Empress, a devout Catholic, had given the Jesuits a free hand in this matter. This phase of Hutterian history is amply documented by the Austrian historian Josef von Beck, himself a Catholic. [5a] What followed was not a bloody persecution, but children were permanently removed from their parents, and indeed, the older people themselves were placed in monastic institutions. All worship outside the prescribed state churches was forbidden. Hutterianism was blotted out, except for a small party of sixty souls, which fled across the Transylvanian Alps to Wallachia. Wallachia was then under Turkish suzerainty, and here the Hutterians were accepted and permitted to settle near Bucharest. This was in 1767. The following year war broke out between Turkey and Russia. Unexpectedly, the brethren found themselves in the vortex of retreating and advancing armies, with no peace in sight. When the Russian commander-in-chief, Count Rumiantsev, offered them free land on his estates in the newly-acquired Ukraine, the Hutterians willingly accepted the offer. In 1770, they made the long trek from Bucharest to the Desna River, a tributary of the Dnieper. For over one hundred years the Hutterians lived in Russia, or rather in the Ukraine. During this period they enjoyed complete religious liberty, control over their schools, and exemption from military service. But it seemed that this very freedom produced dissension within their own ranks. In time the practice of community of goods was discarded, and the Hutterians moved to the Mennonite settlements to the south. The Mennonites and Hutterians had a common Anabaptist heritage, except that community of goods had never been a Mennonite doctrine of faith. Also in matters of dress the Mennonites were much less conservative. There were also some ethnic differences. The Mennonites spoke the Low German of their North German homeland, while the Hutterians spoke a Tirolean dialect. The language in church of both groups was German. The common religious heritage and church language had a powerful impact on the Hutterians who formed by far the smaller group. But before any great changes in Hutterian ways occurred, external developments intervened. In 1870, the Russian government introduced universal compulsory military service. Many Mennonites and all Hutterians decided to leave the country. Ten deputies, two of them Hutterians, were sent by their congregations to explore the conditions of settlement in North America. The group visited many parts of the United States, as well as Manitoba. The eighteen thousand Mennonites who left Russia divided, with approximately one-half of them settling in the United States, and the other half in Manitoba. All the Hutterians, on the other hand, settled in the Dakota Territory, in an area that subsequently became the State of South Dakota. There were about five hundred Hutterians in all. But about one-half of them decided to relinquish community of goods and to settle as individual landholders. Descendants of these Hutterians are almost indistinguishable from other Americans. Some of them have served as elected legislators in the State House and Senate. The community Hutterians on their arrival, in 1874 and in the years immediately following, settled on three colonies. This was of some significance as there are today three major congregations among the colonies, with minor differences among them. The minister of the first colony was by trade a blacksmith, and his group became known as the 'Schmiedeleut' (the blacksmith people). All the Manitoba and South Dakota colonies belong to this group. The minister of the second group was named Darius Walther, and they became known as 'Dariusleut'. The leader of the third colony was a teacher, and his group became known as the 'Lehrerleut'. The colonies of Alberta, Saskatchewan, and Montana belong to these two latter congregations. The Hutterians fared well until 1917, when the United States entered into the war. War fever ran high, and this led to many wild charges against the colonies. The Hutterians, for instance, operated many flour mills. One charge was that they committed acts of sabotage by mixing ground glass with the flour. It was also maintained that they did not contribute enough to the war effort. Their cattle and sheep were driven off their lands and sold to neighbouring farmers at ludicrously low prices. At least two Hutterian boys, who were conscientious objectors, died as a result of mistreatment at an army camp. The Hutterians felt that under these conditions it would be better for them to leave, and they approached the Canadian immigration authorities with the request that they be permitted to migrate to Canada. All but one of the American colonies, thereupon, transferred to Canada, settling in Alberta and Manitoba. The first colony in Manitoba established itself on land purchased from Senator Benard in the Elie district. During the first two decades, the growing number of colonies was not considered a problem. With their almost self-sufficient economy the Hutterians were better prepared to ride out the Depression of the thirties than the individual farmer. Especially in Alberta, municipalities and towns wooed the Hutterian colonies to settle in or near them, for the colonies were in a position to pay their taxes on land and they also paid in cash for purchases in stores. On the other hand, the Hutterian remained what he had been. In many ways he was an alien, marked by his speech, dress, and beard, staying away from the neighbourhood social or dance, and refusing to be drawn into the melting pot. During the Second World War, with the resurgence of national emotions and the upsurge of the national agricultural economy, the Hutterian colonies became the targets for public criticism. This feeling survived the war. In Alberta the legislature passed the restrictive Communal Property Act that prevents Hutterians from purchasing land within forty miles of an existing colony, and also limits their land holding. In Manitoba we have a so-called voluntary "Gentlemen's Agreement" between the colonies and the Union of Rural Municipalities that also restricts indiscriminate Hutterian expansion. Here I would like to break off the first part of my paper and devote some time to a description of a Hutterian colony and of colony life in general. The Hutterian Bruderhof, or colony, is an organic whole in which it is difficult to segregate the part played by such accepted institutions as the church, the family, the school, or the industrial enterprises. The colony is the temporal base for the spiritual church. The colony may have or may not have a special building for church services. The school or the community dining hall serve the purpose equally well. There is a lengthy morning service on Sunday, and a short evening service every day of the week, summer or winter. Attendance is not compulsory, but members and children attend fairly regularly. To the Hutterians colony life itself constitutes divine service. In this sense the instruction of the child, the almost silent meal, the evening spent with the family at home, the day spent at work, are all forms of worship, marred of course by human frailties, failings, and short-comings. The population of a colony ranges from eighty to two hundred adults and children. The colony consists of a nucleus of buildings placed on a land holding of from three to four thousand acres. In Alberta the acreage of a colony may run to ten thousand. The dwellings are built around a spacious community kitchen and dining hall. Beyond these are the farm buildings, barns, granaries, implement sheds, carpenter and blacksmith shops, the public school, the hatchery, the killing plant, the poultry houses, the turkey compounds, and numerous buildings required for the different farm enterprises. The whole pattern of the colony resembles that of a cluster-type village, but the arrangement of the buildings is more functional than beautiful. Within the larger brotherhood each colony constitutes an autonomous, economic unit, but is ready to extend help and assistance to another, less well-to-do colony. The help may be in the form of an interest-free loan, a direct cash contribution, a contribution in kind, or the dispatch of a team of workers to help in urgent work, be it harvesting or the building of a new barn, or canning for winter. The administration of a colony is democratic. The entire baptized, male congregation is the final authority in all major undertakings. It also elects a council or five or six members, known as Zeugbruder, who hold their positions for life. Indeed, all elective offices are for life, but an occupant may forfeit his position if he is guilty of a serious misdemeanour, or he may be elected to a different office, and then would relinquish his former post. The spiritual head of the colony is the Diener am Wort (minister), who occupies the most respected position. If the colony is large, he may have an assistant. Candidates for this are nominated by the male congregation of the colony, but the final selection is made by the drawing of lots. The colony manager, known as the Haushalter or Wirt (householder or steward) is the secretary, the treasurer, and the coordinator of the various economic enterprises. He is assisted by the Weinzierl (farm-manager). No position entails any special favours or privileges. Even the minister has his specific manual duties, be it as a gardener, bee-keeper, or carpenter. In addition to these positions every enterprise has its elected head. There is the Hennemann (poultry-man), the Viehwirt or Kuhmann (cattle-man), the school-master, the head carpenter, blacksmith, turkeyman, the usually elderly Brotmann (bread-man), who supervises the dining hall, and many others, each one in charge of specific tasks. Generally outsiders refer to these men as "bosses", the farm-manager as the farm-boss, the steward as the colony-boss, the pig-boss, etc. The Hutterians disapprove of this terminology, but some are beginning to use it themselves. Then there are the positions occupied by the women. These are elected to their posts by the male congregation of the colony. There is the Haushalterin or Kiichenfrau (stewardess or kitchen-woman), whose chief duties are in the kitchen, planning the meals and establishing the order of rotation in which the colony women are required for kitchen duties. The Zuschneiderin (seamstress), who works in close co-operation with the stewardess, is in charge of the purchase and distribution of cloth. Almost all the clothes worn on the colony are made by the women at home, each woman sewing for her family. The Gartenfrau is in charge of the gardens and of winter canning. The Hebamme (mid-wife), the Kinderweib or Kinderangela (kindergarten teacher), are each responsible for the work in their domain. Since the average colony has a population of about 120, and more than half of it are children fourteen years and younger, and at the other end of the age scale are the retired members, it becomes evident that practically every adult, male or female, occupies some position of responsibility in the administration and operation of the colony. 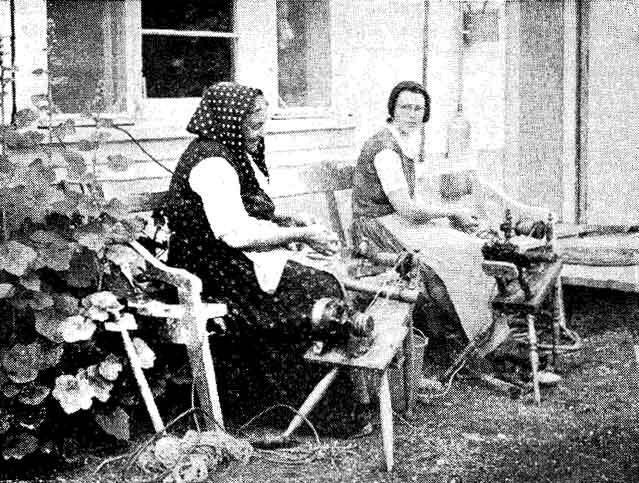 Mother Kleinsasser and daughter Elisabeth at the motorized spinning wheel at the Crystal Spring Colony. Mrs. Kleinsasser is in charge of the colony kindergarten. The Hutterian family itself may be termed as patriarchal, but does not differ markedly from the Western European family pattern. Divorces are not permitted, and illegitimacy is almost unknown. Marriage generally takes place between the ages of twenty to twenty-four, that is, shortly after the marriage partners have been received in church through baptism. Both parties have to be members of the church. The man may select his bride from the home colony, or from any other colony. Marriages with outsiders are rare, but are permitted, provided the outsider joins the Hutterian church. The wedding itself takes place on the groom's colony. It is marked by a church service, followed by a modest celebration. Hutterian rules permit moderate drinking of alcoholic beverages, but smoking is forbidden. There is some singing at weddings, but Buhlenlieder (frivolous songs), are not tolerated. Except for a Bible and perhaps some other books, there are no gifts. Invariably the wife moves to her husband's colony. The newly-married couple is assigned one or two rooms, but transfers to a larger home as the size of the family increases. Hutterian homes have no kitchen, as the food is prepared in the community kitchen, and consumed in the common dining-hall. As a rule Hutterian families are large, averaging ten to twelve children. The family relationship is wholesome, and violent quarrels are practically unknown. Indeed, the whole community resembles in many ways an outsize family, in which the atmosphere is happy and cheerful. The clothes worn by adults and children are plain. Ornaments are forbidden. Sometimes the girls and young women chafe under these restrictions. Boys and young men sometimes acquire musical instruments or radios, both in violation of colony ordinances. Older women may show a weakness for idle gossip, and a man may occasionally take one drink too many or smoke a cigarette. These weaknesses carry with them the strong disapproval of the church and the community members. Generally a visit from the minister persuades the delinquent to conform to colony ways. In more serious cases a member may be punished in that the congregation "takes his peace" (seinen Frieden nehmen). He is shunned, a practice known as the Meidung, and isolated, whether at work, or at the table. And, indeed, he may be assigned living quarters separate from those of his family. He is re-admitted into the congregation when he shows repentance. If the member refuses to make his peace, he may be placed under the ban. This may go so far as exclusion from the colony. There are only a few instances of this in the Hutterian history. In 1928, one Hutterian in Manitoba became a member of the Jehovah Witnesses. He was permitted to remain on the colony provided he did not attempt to proselytize among the community members. When the estranged member felt that he could not abide by his promise, he was asked to leave. The aged in the Hutterian society are not required to work, but will help voluntarily whenever they can. Their opinions on all matters are valued and respected. The Hutterian school plays an important role in colony life. The kindergarten is perhaps the most attractive feature of any colony. It is headed by a female teacher, who may have one or two assistants. From the kindergarten the children proceed to the public school. The latter is administered by a senior government official, and staffed by non Hutterian teachers. Here the English language and the prescribed curriculum of the province is used. However, one hour before the opening and one hour after the closing of the public school is devoted to religious instruction by a Hutterian teacher. Attendance at colony schools is exceptionally good, averaging over 90 per cent. The schools are located on the colonies, and transportation and bad weather are no problems here. The Hutterians are not opposed to elementary education, but do not favour education beyond junior high school. However, there is no rule against it. Once the child leaves the school his education continues in the form of apprenticeship in the different colony enterprises. The economic basis for the colony is provided by a highly diversified form of agriculture. The Hutterian belief makes it practically mandatory for its members to be farmers. When the colony population grows beyond a certain number, a branch colony is set up on newly-purchased land. A division takes place, and half the community moves to the new location. Both colonies, after that, function as fully-independent units. The assets of a colony, depending on the land, the machinery, the buildings, etc., may represent the cash equivalent of from one-half to one million dollars. A colony will generally have pigs, cattle, chickens, ducks, geese, turkeys, and may raise diversified crops ranging from canary seeds to feed grains. The colony's own economy supplies the major needs of the community, whose greatest problem is to feed, clothe and shelter a population that doubles within every sixteen to twenty years. For centuries the Hutterians resisted state-demanded, religious conformity. Canada and the United States provide them with full religious liberty, but there are strong elements in both countries which insist on the cultural assimilation and uniformity of all citizens. But in the complex Hutterian pattern, the religious and cultural values are so interwoven that the group feels that a compromise, or displacement of old values, is a threat to its existence. What the future holds for the Hutterians in Canada is difficult to foretell. It is possible that they will in time be accepted, with their peculiarities, as a component of the Canadian mosaic. In turn, they too may change in some ways. Their qualities and characteristics are not incompatible with the ideals of the larger society around them. Their colonies function on democratic principles; there is a marked absence of crime among them; the people lead sober, frugal lives. They emphasize family life, and take good care of their children and the old people. The public school is accepted without a protest. On the whole the Hutterian communities show remarkable vitality. Moreover, they continue to hold the loyalty and devotion of their young people. 1. The Hutterians are more generally known as "Hutterites". Their own constitution, as incorporated by Act of Parliament, however, refers to them as "Hutterian Brethren". 2. Cf. Peter Riedemann, Confession of Faith, English translation from the original German edition of 1565, in the British Museum (England, 1950), p. 88. 3. Frantisek Hruby, Die Wiedertäufer in Mahren (Leipzig, 1935). 4. English translation by H. S. Bender, "A Hutterite School Discipline of 1578 and Peter Scherer's Address of 1568 to the Schoolmasters" appeared in the Mennonite Quarterly Review (Goshen, Indiana, October, 1931), pp. 231-244. 5. Cf. Joseph Besse, A Collection of the Sufferings of the People Called Quakers (London, 1752), pp. 420-432. 5a. Josef von Beck, Die Geschichtsbücher der Wiedertaufer in Osterreich-Ungarn, Fontes rerum Austriacarum, II. Diplomatica et Acta, XLIII (Vienna, 1883). 6. Copies of the correspondence are on file with the records of Mr. E. A. Fletcher Q.C., Winnipeg, solicitor for the Hutterians. The letter from James A. Smart, Deputy Minister of the Interior, is dated Ottawa, October 27, 1899. 7. Winnipeg Free Press, October 16, 1919. 8. B. Clark, "The Hutterian Communities" in The Journal of Political Economy (Chicago, 1924), XXXII, 3 and 4, pp. 357-374, 468-486, page 363. 9. Bert Kaplan and Thomas F. A. Plaut, Personality in a Communal Society, Analysis of the Mental Health of the Hutterites (University of Kansas, Lawrence, Kansas, 1956), page 12. 10. Cf. Clark. "The Hutterian Communities"; L. E. Deets, The Hutterites - A Study in Human Cohesion (Gettysburg, Pa., 1939) ; W. D. Knill, "Hutterian Education ." (unpublished Master's thesis, Montana State University, 1958) ; Joseph Eaton and Albert J. Weil, Culture and Mental Disorders, A Study of the Hutterites and Other Populations (Glencoe, Illinois, 1955). 11. J. W. Eaton and Robert J. Weil, "The Mental Health of the Hutterites", in Scientific American, Vol. 189, No. 6, (December, 1953).